Woodhill Road, Bishopbriggs, Glasgow. G64 1JL. Tel: 0141 762 2262. Opened in 1965 The Nairn was built to cater for weddings and functions in the area. It was equipped with three bars a function room and a large kitchen. Scandinavian decor was a feature of the lounge bar, a wall separated it from a small cocktail bar in broken wrought iron work with artificial climbing plants. The ceiling of the cocktail bar was railed into sections by narrow black oak beams, the walls were panelled in elm intersected with ebony strip wood. 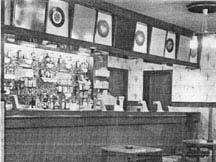 The bar front was of elm wood with a black speckled bar counter. The walls were decorated with prints of vintage cars, the light fittings suspended from the ceiling were replicas of old oil lamps. On the upper floor was the function room with a brides room for weddings. There was also a small stage at the end of the room. Adjacent to this was the large kitchen. Another feature of the Nairn was the stereophonic music system which was wired throughout the whole building. The Nairn was owned by the West of Scotland Taverns part of J & R Tennent group and managed by John Middleton. Manager of The Nairn, John Middelton. 1965. Interior view of the new bar. 1965. Interior view of the cocktail bar. 1965. Now Called The Campsie. Tel: as above.